[Anna E. Blanton was Elisha's second wife. Died at Egan, Johnson Co.
Do not copy the articles or pictures in this blog without the consent of the author. I am a retired school counselor and genealogy is my passion. I have been researching my family since 1994. 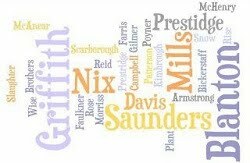 My main family lines are Blanton, Griffith, Saunders, Nix, Mills, Prestridge, Davis & Rose. If we have families in common, please email me. Copyright 2009-2012 Deborah Blanton McCoy. Awesome Inc. theme. Powered by Blogger.